Use for wind damp stagnation of the collaterals accompanied by heat toxins causing toothache, tooth infection, acute and chronic gum disease, and bleeding gums. Odontitis, Odontorrhagia, Gingivitis, toothache, etc. Odontobothritis is a common dental infection which is also characteristic of Dentagia, Abscess, Pyorrhoea, Vacillate tooth. Patients suffer a lot of pain. It affects chewing function of your teeth and hence causes harm to the digestive system. Western doctors use to treat patients with antibiotics, antipholgistic or painkillers. To treat serious cases, doctor may apply dental surgery to extract tooth. 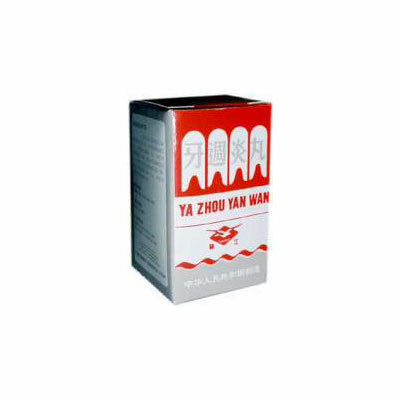 Based on Chinese medical theory, this product is scientifically made from a variety of precious Chinese herbal medicine after long researches and experiments carried out by a group of long experienced Chinese doctors. Case tests by Chinese hospitals have proved that the “Ya Zhou Yan Wan” is an efficacious remedy in the treatment of Odontitis, Odontobothritis, Pyorrhoea and infections after Odontoptosis. The efficacy rate has researched 96.8%. It sets a break-through in the treatment of Odontobothritis. Clears heat, resolves toxin, dispels wind and eliminates damp, relieves pain.